A cement production plant seeks to shift from fossil fuel burning to incineration of tyres and other waste despite community fears over air pollution and dioxins. The current conflict surrounds Irish Cement's application to change to incineration of waste to produce energy for local cement production. Local campaigners have sought to raise awareness of the dangers of air pollution associated with this shift to waste incineration. A petition reads: "Earlier this year (2016), Irish Cement Limited applied to Limerick City and County Council for permission to incinerate used rubber tyres and domestic waste and use this to fuel their cement kiln in Castlemungret. Their original plan was to incinerate 210,000 tonnes per annum. However, they withdrew this application and re-applied with a lower quantity (90,000 tonnes).We should all monitor this closely. It is common knowledge that burning tyres in the open is extremely harmful to human health and the natural environment. The fumes emitted contain many toxic chemicals. The Irish Cement plan will be burning the waste in a kiln. It is not clear how this kiln will filter the toxins and micro-particles produced so that they do not pollute the atmosphere in the locality. The micro-particles are extremely worrying. These are similar to the particulate matter emitted from diesel engines and are so small that they can penetrate the lung. Again, no data has been produced to show how these particles can be dealt with in a safe manner. The test data that has been produced to justify this incineration process is questionable." This is not an isolated case in Europe and around the world. Waste incineration in cement kilns is seen as one of the biggest obstacles to zero waste solutions and a major source of pollution with severe impacts on the environment and public health. This was a conclusion of a European Gathering Against Waste incineration in Cement Kilns in 2014 . Project Details Irish Cement has two cement production facilities in Ireland, one in Platin, Co.Meath and the other in Castlemungret, Co. Limerick. It is the latter plant that they wish to shift from fossil fuel burning to waste incineration. In the words of journalists prasing the plan : "IRISH Cement has formally applied for planning permission to transform the way it operates at its plant in Limerick. 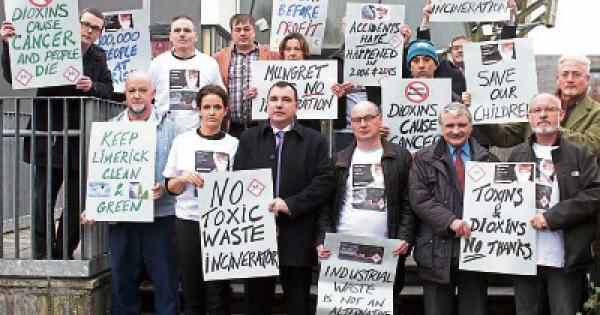 The firm is seeking the go-ahead from Limerick City and County Council for a development which will allow for the replacement of fossil fuels through lower carbon alternatives at the Mungret plant. The project will also allow for the use of other raw materials. In a move which will see 40 new roles created over the lifetime of the €10m plan, Irish Cement will burn rubber from used tyres at more than 1,400 degrees celsius. This should allay fears of any impact on the environment, because due to the high temperature, the material will immediately become liquid, like lava, and set immediately. It also solves the problem of used car tyres which are piling up around the country.Thousands of tonnes of tyres will be ferried to the Mungret factory, along with shredded plastics which waste disposal companies cannot process." Relevant government actors Limerick City and County Council. Environmental Protection Agency, www.epa.ie, issues licences to permit shift to waste incineration. Development of Alternatives Alternative proposals are for the plant to use higher quality coal and natural gas. Why? Explain briefly. Currently awaiting outcome of EPA decision on 5th January 2017 as to whether Irish Cement will be granted a licence. European gathering of academics and activists campaigning against incineration in cement kilns (with links to academic articles and other material). Stop Irish Cement Limited from Using Rubber Tyres and Other Waste as Fuel to Make Cement.